A work colleagues birthday inspires me to create a birthday cake. I knew he loved Krispy Kreme donuts but discovered their Wynyard shop had closed and the Central Station shop was unfortunately too far to get to during my lunch time. 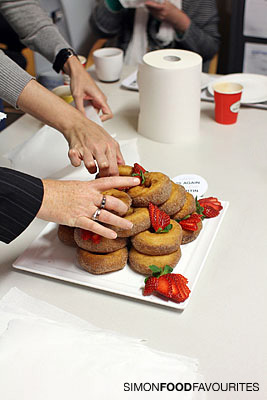 A trip to the CBD Town Hall Woolworths scores me cinnamon donuts on special ($2.48, 12 pack) and strawberries ($3.98, 250g punnet). 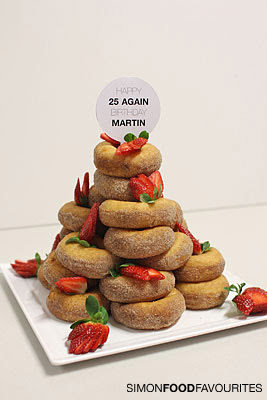 For my 39th birthday I did something similar using mini iced donut which tends to work better. Of course it's not as good as a real French croquembouche which you'd find at Patisse. 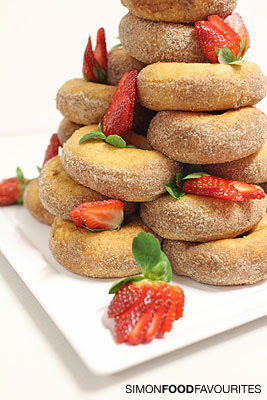 Cinnamon donut & strawberry croquembouche ($8.94) — feeds 24 people for afternoon tea. Plate and birthday card not included. 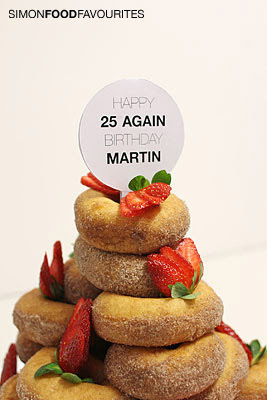 Gotta love a cinnamon donut birthday "cake"! If I may, I will confess I bought a cup of mini ones when at Woolies the other day and ate them all while shopping... bad bad me! Mr Chipconnoisseur is a big hot cinnamon donut lover and we've noticed the same lack of the hot variety around Wynyard... Opportunity to open shop, maybe? Well, now I'm craving cinnamon donuts. XDD Looks so so good! This is such a great idea.. that's what I call quick thinking.. makes me wants donuts, I will be making some this weekend!